All gymnasts dream about that perfect score or executing a routine that feels perfect. Shouldn’t a perfect score be the goal of every gymnast? Shouldn’t you be trying for a perfect routine every time you hit the mat? After all, isn’t going for perfection the reason why you spend an incredible amount of hours in training? 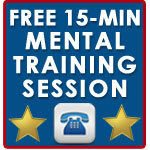 The topic of shooting for a perfect score is often misunderstood. 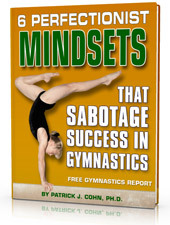 Some gymnasts and coaches wrongly conclude that if you’re not striving for perfection, you’re accepting mediocrity. 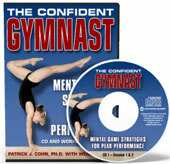 These gymnasts further their argument by believing, if you shoot for perfection and miss, it will result in your best performance. Maybe you subscribe to this belief yourself… If you strive for perfection, you may not score a perfect score but at least you will have a personal best performance. Has this approach come to fruition for you? Not only does this approach rarely lead to a perfect score, it usually produces subpar performances. The reason is that the pursuit of perfection carries with it unbearable and overwhelming pressure. You have probably experienced this pressure to some degree from outside sources… You score great on a routine… You feel happy and proud… But as soon as you talk to your coach, your coach tells you about two little mistakes you made. That positive feeling you had just as you landed feels not so positive. When you see your parents after the meet, they run through a litany of your mistakes… Now you feel deflated. At your next meet, you try to avoid all those criticisms and look to perform everything perfectly. Your nerves get the best of you and your routine falls short of expectations. This dynamic is the biggest reason gymnasts drop out. Perfectionists have a love/hate relationship with their sport. Doing your best has nothing to do with striving for mediocrity. Doing your best is the pursuit of nailing your routine, learning from past mistakes, adjusting when things don’t go well, and taking your skills to competition. If you’re human, perfection doesn’t exist. How many times in your career has your routine felt perfect to you? Look at UCLA gymnast Katelyn Ohashi for example… Ohashi was Olympic hopeful early in her career and spent four years on USA Gymnastics’ junior national team. Due to the pressure, personal issues, injuries and lack of joy, Ohashi dropped from elite competition in 2015. Ohashi described how she felt during her struggles back in 2015. Fast forward to the 2019 Collegiate Challenge… Ohashi, after much reflection, had reignited her passion and the joy she once had for the sport. 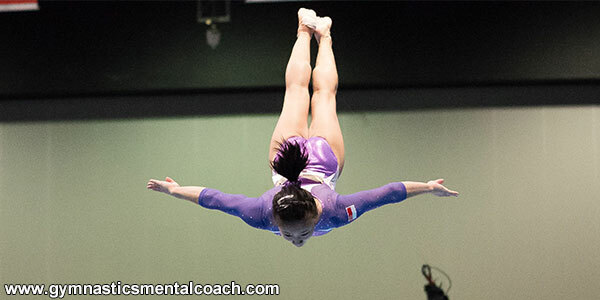 Instead of perfection, Ohashi focused on the joy of competing and just immersing herself in her floor routine. The result was a 10! The energy, enjoyment and confidence Ohashi exuded was undeniable. Gymnastics is a demanding sport but it doesn’t need to be a miserable experience. You don’t need to be perfect in training, perfect in competition and perfect in scoring. If it’s not fun, why compete? You need to find that fun. Performing your best is the direct result of loving want you are doing. Fun or Striving for Perfection? hitting a good landing, etc. Each week, try to add to your FunBook. Take your book with you to meets. Accept that trying to be perfect is not the goal nor obtainable. Instead, the goal is to get the most out of your skills from practice when you compete!